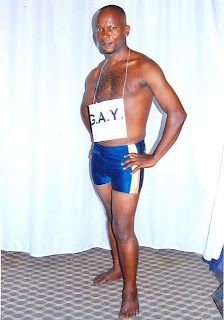 This openly gay Nigerian man who recently opened an exclusive outfit for gay parties is Okechukwu Kingsley Uba. Okechuwku opened the first gay entertainment company in Abia State called Men Gay Entertainment and their services include providing gay dancers and ushers for private parties etc. This guy is such an idiot. I have absolutely no problem with gay people, but y'all should go and see all the crap he writes on his Facebook Wall about Jesus being gay and all. Ode man!